​Known for its magical ambiance, stroll the beaches of Wailea, discover the waterfalls of the Iao Valley, explore the road to Hana or watch the sunrise from Haleakala. S​earch the seas of Maui for the coveted North Pacific humpback whales in the waters off Lahaina during their mating season. Prime viewing is December through March. Experience the only vacation condominium in Lahaina that is right on the beach. Set on the ocean's edge of Lahaina Town in West Maui along historic Front Street, this 199-room condo resort features spacious studio, one-bedroom and one-bedroom penthouse condos with full kitchens, oversized lanais and laundry facilities. Relax by the pool and whirlpool spa after strolling the shops of Lahaina, just steps away. 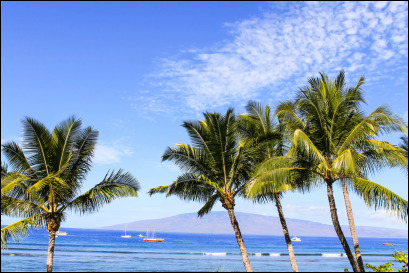 Rates are based on round-trip air travel from San Francisco, California (SFO) to Maui, Kahului, HI, and are subject to airline and/or resort availability. Rates quoted are per person, based on double occupancy unless otherwise stated. Advertised vacation rate(s) valid for select travel, Monday departures Mar 11, 2019 - Mar 14, 2019. Have your own airfare? Ask about land only rates. Kids Stay FREE on Maui! Search the seas of Maui for the coveted North Pacific humpback whales which frequent the bay around Lahaina during their mating season. Officially, whale season in Maui runs from December 15th-May 15th, although it's still possible to see whales outside of the official“whale season” dates. While the first Maui whale sighting differs every year, it's lately been as early as September that humpbacks are spotted in Maui and as late as May. *Price per person based on double occupancy. 3 night minimum stay. Airline taxes are additional.